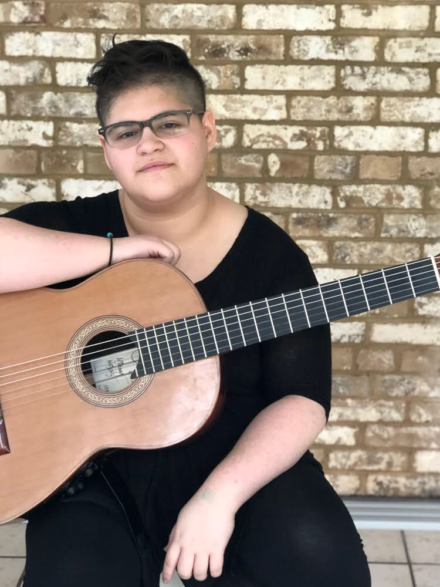 Classical guitarist Infinity Willner’s (they/them) performances have been described by their audiences as powerful and emotional. Through activism and experimentation within many performance contexts, they seek to break down barriers between audiences and performers creating music that is allowing for accessibility to audiences not often well-acquainted with Classical Music. Growing up in Washington, DC in a musical family, they had their hands on instruments before they could speak. At five years old, they found their love for guitar under the mentorship of famed punk rocker, Mary Timony. The spirit of rock runs through their playing to this day. At eight years old, they felt called toward the classical music realm and began their work with Magdalena Duhagon. At the young age of fourteen, they connected with Julian Gray, professor of Guitar at Peabody Conservatory, and began their studies under his esteemed tutelage. At sixteen, they graduated high school a year early in order to attend Peabody as a full-time student. Infinity maintains an active performance schedule, has won multiple guitar competitions, and was recognized as a 2017 YoungArts Foundation winner Through the YoungArtsprogram, they had the privilege to work with well-respected musicians such as David Eggar, Christian Hebel, Lance Horne, Elizabeth Roe, Julian Wachner, and members of the ETHEL String Quartet. Current projects include collaborating with the highly regarded Baltimore singer/songwriter, Christen B Taylor on her new album, entitled “Good Grief,” set to come out within the next year. They are also a member of Balagan Duo with violinist Audrey Maxner. In addition, they are always working passionately with the LGBTQ+ community to empower the voices of the unheard LGBTQ+ artists in the world. Infinity plays a 2012 Michael O’Leary guitar named Fergus.